In Western Europe the fate of biodiversity is intimately linked to agricultural land use. A driving force behind biodiversity decline is the gradual conversion of Europe’s traditional integrated rural landscapes of nature and agriculture into monofunctional units of production. With these developments, semi-natural landscape elements have increasingly disappeared from agricultural landscapes. A growing body of research, however, underlines the importance of semi-natural habitats in agricultural landscapes for biodiversity conservation, habitat connectivity, and ecosystem services. On the local scale, considerable variation between the relative area of landscape elements on individual farms can be observed. Farm management decisions are presumed to be important determinants for the composition of agricultural landscapes and the services provided to society. By bringing together data from farmer interviews and aerial photographic imagery, this paper analyzes the predictive validity of farm management characteristics to understand the distribution of landscape elements on farmland parcels. The farm management parameters included in the study are relevant to current dominant trends in the Dutch agricultural sector; intensification, scale enlargement, diversification, and gradual termination of farming activities. Scale enlargement and migratory processes are found to be important predictors. The results of the Dutch case study provide insights in the threats and opportunities for the conservation of semi-natural habitat in agricultural landscapes. The findings present an empirical contribution to the debate on sustainable management of agriculture’s green infrastructure and, in broader perspective, the objective to reconcile agricultural production with the urging need of biodiversity conservation in Europe’s spatially contested countryside. From a bird’s-eye view, the countryside in the Netherlands is an apparent expression of complex human-environment interactions. As soon as urban fringes retire, a matrix of cropland and pastureland predominates the appearance of the Dutch countryside. Amidst the mosaic of cultivated land and built environment, remnants and pockets of semi-natural vegetation and small biotopes sparsely scatter the landscape (Grashof-Bokdam & Langevelde 2005; Opdam et al. 2000). A growing body of research indicates that these semi-natural landscape elements are among the most important factors in predicting biodiversity in agricultural landscapes in Europe (Aviron et al. 2005; Benton et al. 2003; Billeter et al. 2008; Burel et al. 1998; Grashof-Bokdam & Langevelde 2005; Michel et al. 2006). In addition to its role for biodiversity conservation and ecosystem functioning, semi-natural landscape elements serve as green amenities that are important to the aesthetic, historical, and cultural value of a landscape (Agger & Brandt 1988; Burel & Baudry 1995; Fry & Sarlöv-Herlin 1997). In the past century, many semi-natural and natural landscape elements have lost their traditional economic functions (field partitioning and fuel), despite their services to society, and consequently disappeared from Europe’s agricultural landscapes (Grashof-Bokdam & Langevelde 2005). In the Netherlands, virtually every square meter of land is planned and accounted for. Within this context, physical land use cover is mainly the result of human-decision making (Carmona et al. 2010). Bounded by an operation space of historical, biophysical, and socio-economic conditions, farmers are presumed to be decisive agents in rural landscapes as they modify the landscape to adapt it to their needs and preferences (Bohnet et al. 2003; Kristensen et al. 2001). Different farm management decisions happen in appraisal of farmers’ internal motives and responses to external forces. These decisions and resulting land management can be of explanatory value in studying and understanding land use patterns and farmland heterogeneity (Orsini 2013; Valbuena et al. 2010). In the Netherlands and North-Western Europe at large, four dominant macro-developments in farm management can be identified throughout the scientific literature: intensification, scale enlargement, diversification, and gradual termination of farming activities (Agricola et al. 2012; Meerburg et al. 2009; Renting et al. 2009; Horlings & Marsden 2012). These agricultural trends and developments are occurring alongside each other crystallizing in a heterogeneous composition of rural landowners and farm management strategies (Pinto-Correia & Kristensen 2013). In consideration of this heterogeneous socio-economic composition of the contemporary countryside, policy and planning efforts can benefit from a greater understanding of the relationship between farm management and landscape outcomes to improve effective targeting and identify the main drivers and threats to valuable landscape functions. The case study presented here aims to add empirical findings to this discussion with particular focus on the predictive validity of farm level characteristics in understanding inter-farm differences in landscape elements on farmland in the Netherlands. The relationship and correlation patterns between farm level characteristics and landscape composition have been a matter of debate for the past decades ((Agger & Brandt 1988; Almeida et al. 2013; Bohnet et al. 2003; Deffontaines et al. 1995; Gibon 2005; Kristensen 2003; Munton et al. 1989; Sullivan et al. 2011). Thus far, a range of studies have been conducted on the spatial distribution of semi-natural habitat in agricultural landscapes in relation to farm management. These studies have emphasized and included different explanatory farm-level variables and studied different geographical regions. Withstanding variation in scope, focus, and design of these studies, reoccurring topics in the relationship between farm management and the occurance of semi-natural landscape elements include the production intensity and scale of farming, the impact of hobby and part-time farmers (i.e. pluractive, lifestyle farmers), the influx of urban newcomers in agricultural areas, and the influence of policy schemes and governmental incentives. Several studies demonstrate an association between agricultural intensification,and decreased landscape heterogeneity and the fragmentation of perennial natural vegetation in agricultural landscapes (Benton et al. 2003; Diekötter & Crist 2013; Van der Sluis et al. 2016). The production intensity of agricultural land has found to have a negative impact on the semi-natural habitat of agricultural landscapes as shown by empirical evidence in case studies conducted in Austria, Czech Republic, Denmark, and France (Agger & Brandt 1988; Schmitzberger et al. 2005; Sklenicka et al. 2009; Thenail 2002). Farm size has been identified as the strongest influence on semi-natural habitat in farmland amongst farm management characteristics in studies in Denmark, the United States, and Australia (Levin 2006; Lovell et al. 2010; Seabrook et al. 2008). Sullivan et al. (2011) identified livestock density as an important farm management variable to predict the relative quantity of landscape elements whereas Baudry et al. (2000) conclude that there is a negative relation between arable farming, as opposed to dairy farming, and the occurance of semi-natural vegetation. The relationship between farmers’ age, farm succession options, and land use practices has been established in studies in Denmark and England (Kristensen et al. 2004; Potter & Lobley 1992). In the Netherlands and the larger European region the number of part-time and hobby farmers has grown in the past decade (Agricola et al. 2010; CBS 2012; Primdahl 1999). Vacant farms have attracted urban migrants seeking the rural amenities of nature, tranquility, and lifestyle farming (Agricola et al. 2010; Madsen et al. 2010; Munton et al. 1989; Orsini 2013; J. Primdahl 1999). It has been argued that limited reliance on agricultural income and smaller production stakes of hobby farmers leaves more room for nature and landscape values in farm management decisions (Renting et al. 2008; Walford 2005). Their potential role as stewards of the landscape has received considerable scientific attention. Nevertheless, current research suggests that no univocal relationship exists, which is possibly due to the large heterogeneity among part-time and hobby farmers (Busck et al. 2006; Kristensen 1999; Munton et al. 1989; Pinto-Correia & Kristensen 2013; Primdahl & Kristensen 2011; Schmitzberger et al. 2005). The landscape implications of the influx of urban newcomers and other lifestyle farmers remains understudied although a number of studies have addressed its importance to understand the current socio-economic composition of peri-urban and rural areas (Bohnet et al. 2003; Paquette & Domon 2003; Lee 2005; Zasada 2011). Voluntary agri-environmental schemes (AES) are among the EU’s main instruments to promote and compensate farmers for engagement in nature and landscape conservation activities (Ingram et al. 2013; Piorr 2003). The efficacy and impact of AES on the landscapes in terms of semi-natural habitat remains an interesting discussion. In Denmark, Primdahl (1999) concluded that hobby farmers planted most hedgerows without the help of agri-environmental schemes whereas full-time farmers tend to establish/maintain hedgerows with subsidy support. Wrbka et al. (2008) recorded a loss of linear landscape elements despite high AES participation in the Austrian landscape while no differences have been found between scheme participants and non-participants. This paper contributes to knowledge on landscape dynamics in relation to biodiversity conservation in rural landscapes by empirical assessment of how farm management characteristics relate to the existence and pattern of landscape elements in a case study of a Dutch rural municipality. The assessment combines household interviews with aerial imagery to investigate in three-fold analysis related to predominant topics in the literature on rural landscape dynamics and biodiversity conservation; the role of hobby farmers, production, and socio-economic farm characteristics and agri-environmental schemes in understanding inter-farm differences in landscape elements. The discussion section places findings in the larger debate on the threats and opportunities to the current state of semi-natural habitat in agricultural landscapes. Central to the joint development of agriculture and landscape are individual decisions made by farmers as land managers and as custodians of the landscape. Micro-regional scales of several thousands of hectares are highly suitable to address issues and gain understanding of the current relationship between individual farms and their associated landscapes (Orsini 2013; Thenail 2002). At this scale level, the coping strategies and decisions of both individual and groups of people are perceptible and comprehensible as driving factors of landscape changes in interaction with local conditions of policies, regulations, and development. At the same time, the microregional scale tends to avoid the large structural geographical differences that are prominent within national and larger regional scales. These perspectives have motivated the study design to be framed as a case study set within the Dutch municipality of Heerde. Although the municipality of Heerde shares characteristics with other agricultural regions in wider Europe, the geographic scope of study imposes limitations for extrapolation of the findings. A comprehensive literature review nevertheless allows us to compare our findings with previously conducted studies while critically considering the differences in research designs. The study relies on two datasets: 1) Geospatial data on land use cover and the pattern and presence of semi-natural landscape elements on agricultural parcels. This data is derived from the supervised classification of aerial imagery overlaid with topographic and cadastral maps. 2) A quantitative dataset of detailed farm level characteristics derived from face-to-face structured farmer interviews with qualitative commentary from the respondents. The relationship between both datasets has been investigated through quantitative analysis relying on one-way ANOVA and multiple linear regression analysis. Studying the relationship between farm management and the presence of semi-natural land cover on farmland requires clear understanding and consistency of the applied terminology and its operationalization. The share of landscape elements on a farm is measured as the area of canopy of (semi-)natural, perennial, non-productive vegetation on farmland and its direct field margins in relation to total farm size. It is important to note that the study focuses solely on landscape elements on registered agricultural parcels. Elements contributing to the green infrastructure of the agricultural landscape of the case-study are considered (following categorization by Agger & Brandt 1988). Farm management is the process of judicious use, allocation and adaptation of scarce farmland, and additional inputs/resources conducted by the farm manager to accomplish ends. These ends go beyond merely agricultural products (food and fiber) and also include the farm as a residence (the value of a ‘happy’ home) and landscape/nature values that might be intrinsic or serve the diversification of the agricultural business (i.e. agro-tourism, energy farming, or farm care/therapy) (Primdahl & Kristensen 2011; Renting et al. 2008; Zasada 2011). Despite farm management being a complex web of decisions, agricultural censuses, and household data can provide detailed information on productive, technological, and socio-economic aspects of farms (Carmona et al. 2010). Detailed data related to farm management has been acquired through structured farmer interviews conducted in March–April of 2012. The design and scope of the interviews is the result of a literature research on post-war developments in farm management strategies in Europe’s countryside (Hauser 2012). The design of the interviews strongly relates to the observation that agriculture gradually lost its hegemonic position in Europe’s (rural) societies with the developments towards mechanization, up-scaling, specialization, lagging revenues, and fewer people employed in the agricultural sector (Marsden et al. 1989; Meert et al. 2005; Stoate et al. 2009). In many parts of Europe, an aging farmer population is afflicted by limited succession opportunities (Agricola et al. 2010; Knierim & Siebert 2004). Vacant farms have attracted urban migrants seeking the rural amenities of nature, tranquil and lifestyle farming (Kondo et al. 2012; Madsen et al. 2005; J. Primdahl 1999; Zasada 2011). The growing voice of urban populations has led to an increased demand for the recreational goods and services provided by rural landscapes and the multifunctional agricultural landscape is increasingly accepted as the cornerstone of the European countryside (Holmes 2006; Renting et al. 2009; Vos & Meekes 1999; Wilson 2007). Policy reforms, challenging market conditions, and societal pressures have led to a multitude of farmer responses and farm viability strategies. In the Netherlands and the wider context of Europe four macro-developments in agriculture can be identified: intensification, scale enlargement, diversification, and gradual termination of farming activities (Agricola et al. 2010; Meerburg et al. 2009). The interviews have been designed to define accurate and quantifiable farm-level characteristics related to these four macro-developments. The interviews are part of a larger research project (VOLANTE) on the land use transitions and future development of rural Europe. Data has been cross-referenced with field visits and available agricultural census data. Key farm level characteristics relate to the aforementioned four macro-developments and are selected based on the literature study reviewed in the introduction section. An overview of the predictor variables used in the study, their definition, the type of data and relevant literature can be found in Table 1. Thirteen variables have been selected to enable differentiation between agricultural land users in Heerde in relation to key macro-developments. None of the respondents were certified as organic farmers – data related to pesticides and fertilizer usage proved to be difficult and unreliable to acquire through the interviews (Van der Sluis et al. 2016). The quantitative data has been integrated with the structured qualitative commentary of the respondents in a database that enables the reference of both quantitative and qualitative data. This research has strongly focused on a quantitative analysis. Predictive variables used in the case-study in Heerde. The sample of farmers in the study has been drawn at random from the national database for registration of agricultural parcels for the municipality of Heerde, which consists of 130 farmers with registered farmland in the municipality. Landowners with less than 1.5 hectares. and with minimal agricultural activities have been excluded from the sampled population. Initially, 65 farmers have been drawn randomly and contacted after a written introduction to ask consent for participation and set up an appointment for a face-to-face interview. In total, 48 farmers were available and consent for an interview of 30–45 minutes. No structural characteristics have been found in the non-response. Four farmers have been excluded from the final sample as they appeared to have very limited agricultural activity (>1.5 hectares of farmland) or most land located outside the municipality’s boundaries. This resulted in a total sample of 44 farmers. Data on land use and the distribution of semi-natural land cover has been collected mainly through the supervised classification of aerial imagery from 2011, acquired through airborne remote sensing. The remote sensing data have been made available for the case study by the Alterra Geosciences Centre of the Wageningen University. The aerial imagery has been overlaid with existent topographic maps of landscape elements (Top-10 Vector 2006; 2007) and cadastral maps (Agrarisch Areaal Nederland 2012; Basisregistratie percelen 2012). Existent topographic maps appeared to be incomplete and out of date. Supervised classification resulted in up-to-date and highly accurate data on the distribution of semi-natural landscape elements registered with agricultural parcels. Cadastral information and in-field observations were used to clarify ambiguous cases, such as semi-natural landscape elements bordering fields owned by different farmers. Agri-environmental scheme contracts in place have been assessed through the geodatabase of the province (Agrarisch Areaal Nederland 2012). Ultimately a map has been assembled with the land under AES contracts and the area of landscape elements on agricultural land per farmer. In total, the 44 respondents manage a total of 502 parcels covering an area of approximately 923 hectares including 20.7 hectares of semi-natural land cover. In a threefold analysis – addressing the role of hobby farmers, relevant farm characteristics and agri-environmental schemes – predictive variables are assessed to explain inter-farm differences in the presence of landscape elements on farmland. The first step of analysis looks at the role of agricultural occupation, which has received great attention in the literature (Kristensen et al. 2004; Kristensen et al. 2001; Lovell et al. 2010; Paquette & Domon 2003; Primdahl 1999; Schmitzberger et al. 2005; Wilson 2007). The typology breaks down the heterogeneous farmer population into three classes hobby, part-time, and full-time farmers. Hobby farmers are defined as farmers whose main income is not agricultural but who carry out farming activities without reasonable expectation of financial revenues. Part-time farmers supplement agricultural income with off-farm income, whereas full-time farmers rely mostly on income delved from agricultural production (>80% of household income). As expected from this definition, the data of the case study indicates that agricultural occupation correlates with agricultural income (separate questionnaire entry), which indicates the consistency in respondents’ answers. In addition, agricultural occupation is correlated with agricultural education, farm size, average parcel size, and agri-environmental scheme participation as found in exploratory data analysis. The significance of differences in landscape elements across agricultural occupation classes has been assessed by one-way ANOVA. The second part of the data analysis examines the relationship between farm management and the share of semi-natural landscape elements on agricultural parcels in further detail by assessing the predictive validity of a set of relevant individual farm-level characteristics through multiple linear regression analysis. The analysis follows a three-step procedure to examine the prediction of inter-farm differences in the relative share of landscape elements through farm management characteristics and, consequently, analyzing the relative importance of these predictors. The first step has been elaborated in the introduction chapter in which relevant farm management parameters have been identified through literature research identifying meaningful predictor variables. 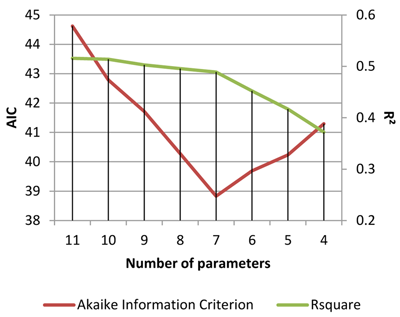 After collecting and operationalizing these farm management characteristics (overview in Table 1 and paragraph 2.2–2.3), the second step assesses the full model of these predictors and consequently applying a hierarchical regression analysis (backward linear regression) to remove statistically redundant predictors based on Akaike information criterion (AIC) (Whittingham et al. 2006). AIC rewards goodness of fit, but it also includes a penalty that is an increasing function of the number of estimated parameters. The penalty discourages overfitting that occurs through increasing the number of parameters in the model which almost always improves the goodness of the fit. The preferred model is the one with the minimum AIC value and thereby the model that fits well, retaining maximum information, while a minimum number of parameters are selected. Through multiple linear regression analysis, the explanatory power of farm management characteristics is analyzed as well as the factors that are significantly correlated with the share of landscape elements. The regression model gives insight in the correspondence between differences in farm level characteristics and higher or lower values of semi-natural vegetation cover while controlling for other parameters that interact in the model. These findings can help to identify the aspects of farm management and land use decisions that need to be understood to explain inter-farm differences in the semi-natural landscape elements. Relative weights analysis is conducted to assess the relative importance of predictors to supplement regression coefficients and statistical significance. The relative importance is defined as the contribution each predictor makes to the total explained variance – while taking in considering both its unique contribution and its contribution in the presence of the other predictors (LeBreton et al. 2007). Sole reliance on standardized regression coefficients may prove confusing or misleading especially in the case of in the presence of interactions between farm management characteristics (Nathans, Oswald, & Nimon 2012). Relative weights analysis provides a supplementary technique to decompose the variance in the regression effect to assess the importance of each coefficient on the dependent variable to interpret (Kraha et al. 2012). The calculation of relative weights follows Tonidandel & LeBreton (2011). Assessment of the dataset’s normality, homoscedasticity, linearity, residuals, and multicollinearity are required to determine its suitability for linear regression analysis. The share of landscape elements is heavily skewed towards the 0–3 percent. A natural logarithmic transformation has been applied to meet the assumption of a normal distribution of residuals presumed in linear regression analysis. After transformation, all assumptions of linear regression analysis have been met (see Appendix A for an overview of the assumptions and logarithmic transformation). Finally, in the third section, a descriptive statistical analysis combined with an analysis of the underlying selective procedures and policies give insight in the influence of agri-environmental schemes on the presence and pattern of landscape elements. The qualitative, yet structured, commentary of respondents, gathered during the interviews, has been integrated into the discussion to support understanding of the underlying factors relevant to quantitative findings. The case study is set in the municipality of Heerde in the Netherlands. The area measures 8042 hectares and is home to 18,282 inhabitants. It is a compact municipality with a dominantly rural character and relatively coherent landscape located on the border of the provinces Gelderland and Overijssel –flanked by the higher national park the ‘Hoge Veluwe’ in the west and the lower Ijssel valley in the east (Van der Sluis et al. 2016). Productive farmland is found east of the municipality’s main settlements (Heerde and Wapenveld) along the river Ijssel and forms a typical small-scale riverine landscape dominated by open meadows and (to lesser extent) maize cultivation with scattered hedgerows, shelterbelts, ponds, and small woodlots. The municipality of Heerde has managed to maintain its predominantly rural character although the socio-economic composition and strategies of its land owners has rigidly changed over the last decades. Commercial farms have increased in size, yet decreased in number, whereas small-scale farming remains persistent, yet increasingly economically unviable and marginal (Hauser 2012). Data from the interviews shows that off-farm income is an important economic driver for the livelihood of rural households of Heerde. In many respects, the municipality has reflected changes similar to other Northern European agricultural regions – from ensuring food security in the 1950s to oversupply (1980s) to the present attempts to keep agriculture economically viable and sustainable. Agriculture’s changing role and significance in Europe’s (rural) societies and economies resonates in its changing socio-economic composition and the diversification of farm management strategies and objectives. Nature development and urban pressure further challenge opportunities for expansion of farmland. The selection criteria of Heerde as the study area are multifold. 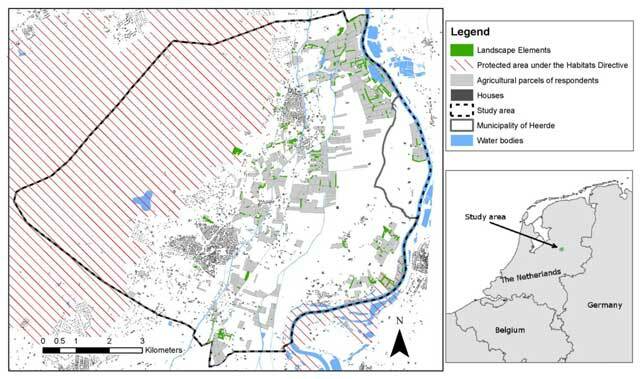 The agricultural land use in Heerde composites of a pattern with both large-scale farming and small-scale farming. The scale and intensity of the agricultural sector of Heerde hover in between the large-scale agriculture perpetrated in the Northern provinces of the Netherlands and the small-scale agriculture seen more commonly in the Eastern provinces. The municipality’s green infrastructure is of particular importance to biodiversity conservation in relation to the vicinity of the Natural Park ‘De Veluwe’ and therefore makes it a relevant study area. The municipality has maintained its rural character; nevertheless, being in the vicinity of larger cities also creates a demand for diversification of farming activities, to serve tourism and urban immigrants (Kristensen et al. 2016). Agricultural land in the municipality is located adjacent to the floodplains of the Ijssel river holding a compact and coherent typically Dutch riverine landscape (An impression of the landscape and landscape elements; see Figures 1a1b). Despite the limited geographic scope of the case study, agricultural developments towards intensification, scale enlargement, diversification, marginalization, and a graying agricultural population are all key developments within the municipality as well as highly relevant to many other agricultural regions in North-Western Europe (Horlings & Marsden 2012; Meert et al. 2005; Vos & Meekes 1999; Wilson 2001). Impression of landscape elements in the case-study area. The agricultural parcels of the respondents and the distribution of landscape elements on their farmland are depicted in Figure 2. The agricultural lands are located in the East of the municipality in the floodplains surrounding the river Ijssel. In total, an area of 923 hectares of farmland distributed over 502 agricultural parcels has been examined. Semi-natural landscape elements cover a total surface of 20.7 hectares which accounts for 2.3 percent of the total surface of agricultural parcels and field margins (ditches are excluded). Semi-natural vegetation is distributed in relatively proportionate manner in relation to the agricultural parcels managed by the respondents as depicted by the colored polygons in Figure 2. The distribution of landscape elements on agricultural parcels of respondents. A classification of the occurrence of landscape elements in relation to the total surface of registered agricultural land per land owner reveals considerable variability among respondents. Around half of the farmers (21 farmers, 47.7%) reserve minimal space (0%–1%) on their land for semi-natural landscape elements. For fourteen farmers, 31.8 percent of the respondents, landscape elements account for 1–5 percent of their agricultural land use. Manhoudt & De Snoo (2003) have recommended a minimum of 5% of semi-natural habitat on farmlands to halt further biodiversity declines in the Netherlands – a number that is met by around one-fifth (20.5%) of the respondents in the study. In the following sections empirical findings on the role of agricultural occupation, farm management characteristics, and AES participation are presented to predict and understand the inter-farm differences in the occurrence of semi-natural land cover. Empirical analysis of the relationship between farm management characteristics and landscape patterns can be helpful to understand the prospect of full-time, part-time, and hobby farming in the management of the green infrastructures in agricultural landscapes. A remaining 55 percent of the respondents derive more than 80 percent of their household income from agricultural activities. The data from the case study reveals considerable variation in the relative surface of landscape elements on the productive land of farmers of different occupational status (see Table 2). The ANOVA aids the understanding of the significance of the classification between in hobby, part-time, and full-time farmers (independent variable) on inter-farm differences in the relative occurrence of semi-natural landscape elements on agricultural parcels (dependent variable). An overview of total share of semi-natural landscape elements on agricultural parcels managed by hobby. part-time and full-time farmers and one-way analysis of variance. 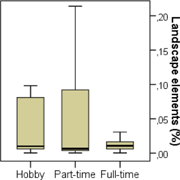 Despite the differences observed between hobby, part-time, and full-time farmers, the case study data does not underpin the significance of the three agricultural occupation classes in understanding inter-farm variation in landscape elements. The relatively small sample size, the large observed within-group heterogeneity observed among hobby and part-time farmers as depicted in the boxplots, and/or the oversimplification of a complex reality into three classes can be driving the model’s predictive insignificance (Table 2). Busck (2002) found that occupational status is not a primary driver in differentiating between different farming styles. The growing diversity of farming strategies among hobby and part-time farmers potentially requires a greater level of parameters to understand underlying predicative aspects of farm management on the distribution of landscape elements on productive farmland (Busck 2002; Kristensen 1999). A more detailed analysis of farm management characteristics can support in deepening the understanding of patterns within the fragmented distribution of landscape elements across different farm areas. A multiple linear regression analysis of farm level characteristics and the relative share of landscape elements can provide insight in the relevance and relative importance of different farm characteristics while taking interactions and shared effects into consideration. Based on literature research and the conducted surveys, a selection of eleven farm-management parameters are included in the full model for explaining inter-farm differences in the relative share of semi-natural landscape elements. The full model and multiple regression analysis can be found in Appendix B. The regression analysis of relevant farm level characteristics indicates a significant predictive value of the overall model (p = 0.013). No direct methodological concerns caused by multicollinearity appear from the collinearity metrics (VIF and tolerance). The R-square reveals that 51.6 percent of the total variance in relative density of landscape elements among farmers can be explained by the selected independent variables, leaving considerable room for variables of influence outside the scope of this study. Purposely the multiple linear regression analysis and supplementary metrics provide information to determine the relation and importance of predictor variables. Three individual independent variables are found to significantly predict the observed variation among farms in terms of the relative cover of landscape elements; scale enlargement (farm size increased >15% in the past ten years), average parcel size and urban in-migration (migrated to current farm stay from urban or town destinations). One of the common difficulties in landscape ecology studies is the large numbers of predictors that are potentially associated with understanding patterns of landscape outcomes. It needs to be taken into consideration that, in general, the expansion of explanatory models with an increasing number of predictors will never result in a decreased explained variance. At worst the explained variance will remain the same. Vigilance is therefore needed in adding redundant predictors to the model. In the case of this study, a model consisting of eleven potentially important farm management parameters has been derived from the literature study. The full model potentially contains misspecification and statistically redundant variables due to the large number of candidate parameters and intercorrelations among explanatory variables. A model selection through hierarchical regression analysis based on AIC has been conducted to avoid these effects and redundancy. The procedure aims at weighting the increase in explained variance (R²) against the addition of a variable. In other words, every added variable should provide significant additional explanatory power to justify the expansion of the model. The model selection thus aims at finding the smallest possible model that best explains data, thereby favoring a concise model over an overfitted large model. The final model, after AIC validation, is presented in Table 3, while Figure 3 depicts the model selection process. The final multiple linear regression model selected through hierarchical regression analysis based on AIC selecting seven relevant farm management characteristics as predictors for the relative share of semi-natural landscape elements on agricultural parcels and direct field margins (criterion). The hierarchical linear regression model selection process based on AIC. Rsquare depicted of the right Y-axis for reference. Based on AIC, the selected model wields seven farm-management parameters while retaining a minimum loss of information. The regression model presented in Table 3 reveals that 48.9 percent of the total variance in relative density of landscape elements among farmers can significantly (p ≤ 0.001) be predicted by the selected independent variables. As in the full model, scale enlargement, average parcel size, and urban in-migration are significant individual predictors for the variance of the share of semi-natural landscape elements across different farms. Average parcel size, followed by scale enlargement and in-migration, appear to have the largest total effect on the dependent variable controlling for other independent variables in the model as indicated by the beta weights. Average parcel size and scale enlargement show a negative impact on the share of landscape elements on a farmers’ agricultural land, whereas farmers from non-agricultural background have significantly higher shares of landscape elements on farmland. In consideration of the negative impact of scale enlargement, the positive influence of farm size is interesting (β = 0.379), however not significant and influenced by model interactions and shared effects. The logarithmic transformation of the criterion complicates the interpretation of the relationships. Zero-order coefficients represent the bivariate correlation (direct effect) between the independent and dependent variable while ignoring the influence of other variables. Zero-order coefficients would equal beta weights in the case that the independent variables are perfectly uncorrelated. Although no direct concerns for multicollinearity exist, apparent associations between independent variables in the model result in shared variance and indirect effects on the dependent variable. The beta-weights and zero-order coefficients indicate that average parcel size and in-migration possess both a large total effect and direct effect on Y whereas the predictive validity of scale enlargement depends on model interactions. Despite theoretic relation, no significant correlation exists between average parcel size and scale enlargement (r = 0.029). A relative weights analysis addresses the commonly found intercorrelations between real-world parameters by partitioning the regression effects based on a procedure that resolves the associations between independent variables through the use of uncorrelated principal components. Thereby, relative weights provide a measure of the total effect of the individual independent variables’ contributions to explain variance in the presence of all other predictors (Nathans et al. 2012). The significant predictors, average parcel size and in-migration, respectively, account for 23.4 percent and 32.6 percent of the explained variance in the model – emphasizing the relative importance of these parameters for inter-farm differences in semi-natural landscape elements. Scale enlargement significantly accounts for 6.9 percent of the explained variance based on the relative weights analysis. Agri-environmental schemes (AES) have been a key element for the integration of environmental concerns into the EU’s Common Agricultural Policy. In principle, the schemes are designed to encourage farmers to protect and enhance the environment on their farmland by paying a compensation for additional costs and income foregone paired with providing environmental services. Implementation of agri-environmental schemes in the Netherlands is constituted in the ordinance ‘Subsidy for Landscape and Nature’ (SNL, Subsidie Natuur en Landschap). The Dutch provinces pre-determine which areas are eligible for agri-environmental schemes based on nature management plans, perceived biodiversity gains, preservation of the traditional landscape, and feasibility under strict budget limitations. Farmers in these agricultural zones are eligible to participate in AES, which implies commitment and compliance with farm management regulations depending on the type of scheme. Among 44 respondents, a total of 10 farmers were engaged in agri-environmental schemes in 2011 (Agrarisch Areaal Nederland 2012). Most of these farmers had three or more different contracts. The total share of land covered by AES is 85.8 hectares. The majority of agri-environmental schemes in the municipality of Heerde relates to grassland management in conservation of meadowbirds and implies restrictions in grassland management: late mowing in June or later, nest protection, and limited agro-chemical inputs. The share of AES directly compensating for the management of landscape elements is limited; eleven contracts shared by two different farmers are in place among respondents. The scale of direct involvement and financial investment in landscape elements through agri-environmental schemes is therefore very modest within the case study. This for a large part is explained by the strict eligibility criteria of AES participation and the small area destined for AES as selected by the provincial authorities. If asked about the statement ‘maintenance of nature and the landscape is part of my responsibility as farmer’ 62 percent of the respondents strongly agree. Other subsidy schemes that can play a role in decision making related to landscape elements of farmers in Heerde are the EU Single Payment Schemes as well as a popular regional fund for restoration of traditional farm yards. The latter lies outside the scope of the study as farm yards not part of the analysis. The height of Single Payment Schemes is determined by the total area of productive farmland. A frequently reappearing concern of farmers, as expressed in the interviews, is that non-productive landscape elements might negatively influence the height of the Single Payment Schemes allowance. Bounded by historical, biophysical, socio-economic, and political conditions, farmers are presumed to be central agents in the dynamics of agricultural landscapes. At a local level, farms susceptible to similar contextual conditions can reveal significant differences in land use outcomes as a result of divergent farm management and land use decisions in appraisal of the farmers’ internal motives and coping strategies to external forces (Bohnet et al, 2003; Orsini 2013). The structured interviews with farmers in Heerde reveal large heterogeneity in farming strategies despite being framed within a compact study area. A common typology based on hobby, part-time, and full-time farming has limitations in explaining the diversity in farm strategies among rural landowners. Despite theoretical suggestions, the classification holds limited significance in understanding the relationship between farm management and the relative presence of landscape elements as shown by the empirical data. Similar findings have been found in case studies in Denmark, England, and Austria (Busck 2002; Busck et al., 2006; Kristensen 1999; Munton et al. 1989; Primdahl & Kristensen 2011; Schmitzberger et al, 2005). In order to capture meaningful diversity in farm management among rural land owners, the analysis focuses on farm management parameters related to the current dominant trends in the European agricultural sector; intensification, scale enlargement, diversification and gradual termination of farming activities. The focus on farm-management parameters as predictors for landscape elements, however, inherently results in underexposure of the importance of biophysical attributes as well as large land consolidation schemes in the 1970s and 1980s and other historical conditions that are important to understand the landscape ecology and the patterns of landscape elements in agricultural landscapes (Van der Sluis et al. 2016). Sklenicka et al. (2009) studied the influence of natural factors and historical and current land use on the disappearance of hedgerows in the Czech Republic. These results pinpoint current land use as the most significant factor. The case study in Heerde reveals little about the explanatory power of farm management characteristics in comparison to other factors, nevertheless it does indicate that the analysis of farm management is meaningful to understand the relative share of semi-natural habitat cover across farm areas – explaining around half of the observed variance. Demographic, socio-economic and political changes of the past decades have coincided with increased acknowledgement of European rural landscapes as multifunctional – providing services beyond agricultural produce (food, fiber) in form of biodiversity, ecosystem services, leisure, aesthetic and cultural services (Pinto-Correia & Kristensen 2013; Wilson 2007). For commercial farmers who rely on this landscape for their livelihood, the agricultural landscape remains an arena for agricultural production in the first place (Primdahl 1999). The respondents indicated during the interviews that negative financial incentives to maintain landscape elements arise from the Single Payment Schemes as farmers fear that semi-natural vegetation and shading effects will influence their subsidy payments for entitled farmland. There are concerns that the presence of non-productive semi-natural landscape elements will be deducted from the productive farmland which is used for the determination of Single Payments Scheme allowances. At the same time, in the interviews farmers expressed pride and responsibility in maintenance of the landscape, in which landscape elements are valued. The future of the green infrastructure of agricultural land finds itself in a field of tension between a renewed interest into landscape elements of farmers and policy makers and a fragile and uncompromising agricultural market that can conflict with ambitious environmental goals (Gibon 2005; Henle et al. 2008). The conducted statistical analysis indicates that average parcel size is negatively correlated with the density of semi-natural landscape elements. Larger parcels generally result in a larger production area as compared to the field’s margin, while the majority of landscape elements are often found in these field margins. Scale enlargement is an important strategy for farmers to remain cost-effective and economically viable within the competitive agricultural market. Farms that have expanded more than 15 percent in total size in the past decade have significant lower shares of landscape elements than others. The take-over of agricultural land possibly leads to farm consolidation and the removal of landscape elements. Scale enlargement furthermore might be an indicator of a farmers’ desire to retain or expand its competitive advantage and encapsulate an attitude in which every square meter of farmland counts. Longitudinal studies suggest a correlation between trends in up-scaling of agricultural practices and the large-scale decline of a dense green infrastructure in agricultural landscapes (Geertsema 2002; Jongman 2002). Interestingly, the static metric of current farm size is not a significant predictor whereas the dynamic behind farm size is (scale enlargement). This could imply that the management of a large farm area itself is not necessarily incompatible with the maintenance and restoration of semi-natural land cover. Agri-environmental schemes might play a role in supporting larger farmers to maintain landscape elements on their farmland. The scale of AES participation related to landscape elements in the case-study is however modest. Scale enlargement and increasing parcel sizes are likely to remain dominant agricultural developments and it raises questions whether regulations, enforcement, and planning options need to be revised to maintain and/or restore the green infrastructure in agricultural landscapes. The initial proposals of the 2014 CAP reform were initially hailed as significant steps towards a ‘greener’ agriculture. The final enactment, however, represents a dilution of the initial ambitions and a ‘missed opportunity’ (Pe’er et al. 2014). The proposed norm of 7 percent of ‘Ecological Focus Areas’ (EFA) held potential to stimulate farmers to maintain permanent grassland and increase non-productive green cover. However, what remains after negotiations is a hollow measure, as most farmers in Heerde are exempt from deploying it. The increased decentralization of responsibilities to member states, however, offers flexibility to weigh the ongoing developments of scale enlargement and agricultural intensification against the loss of public goods such as landscape quality and biodiversity (Pe’er et al. 2014; Sutcliffe et al. 2014). Like the landscape, the socio-economic composition of rural landowners in North-Western Europe has changed over time. Fiercely competitive markets, limited succession of young farmers, and ongoing scale enlargement has put many small-scale farmers out of business (Agricola et al. 2010; Wilson 2007). A void that to some extent has been filled by an influx of urban, town, and other non-agricultural residential migrants, attracted by hobby farming and the charisma of the rural environment (Horlings & Marsden 2012). The empirical data suggests that this group of ‘agricultural newcomers’ has a significantly positive influence on the relative density of landscape elements on agricultural fields. The value attached by them to aesthetic and environmental aspects of living in the countryside plays a role in the initial decision to relocate and consequently plays a role in a possible interest in the maintenance and restoration of the agriculture’s green infrastructure. These findings confirm observations theorized by Slee (2005) and Zasada (2011) who respectively discuss the rise of ‘urban refugees’ and ‘lifestyle farmers’ as actors in the rural environment. Notwithstanding its desirability, there is potential to make the farmland more accessible for the settlement of ‘lifestyle’ farmers. A recent amendment in the Netherlands has broadened opportunities to transform former farming buildings into residential farmsteads, circumventing the regulations related to agricultural businesses such as buffer zones for ammonia odors from livestock farming (Tweede Kamer der Staten-Generaal 2012). The advance of telecommuniting possibilities and fast internet connections in rural areas has opened the opportunities of hobby and lifestyle farming to a larger public. As a financial compensation and incentive, agri-environmental schemes (AES) hold potential to increase the compatibility of maintaining or restoring landscape elements with commercial farming. Budgetary limitations and a strong focus on meadowbird conservation and botanic grassland management within the municipality of Heerde has left little room for AES to have a large direct impact on the preservation of landscape elements. Eligibility criteria, the amount of administrative work and the focus on large agricultural parcels for conservation efforts has generally excluded small farmers from participation. Beyond the required implications of an agri-environmental scheme, the extent to which AES participation can incite a general conservation-oriented thinking is increasingly seen as an important indicator for the success of a scheme (Riley 2011; Wilson & Hart 2001). The indirect impact of AES participation on a wider range of conservation efforts such as the maintenance of semi-natural landscape is an interesting line of thought for further research. The 2014 CAP reform has further restricted the budget available for AES in 2014–2020 (Pe’er et al. 2014). Policy and land management efforts can benefit from a greater understanding of the relationship between farm management and landscape outcomes to improve effective targeting and identify the main drivers and threats to valuable landscape functions. This paper reveals key predictors for understanding the distribution of landscape elements across farm areas at a micro-regional scale. Despite the study’s limitations, the analysis of farm management characteristics related to key macro-developments in European agriculture is found to be meaningful to understand local variation and indicators for both the degradation as well as the (renewed) interest for landscape elements. In consideration of the linkage of semi-natural habitat in agricultural landscapes and Europe’s wild flora and fauna, the findings are relevant to facilitate a better adaptation of policies, regulations, and enforcement for biodiversity conservation. Negative predictors – parcel size and scale enlargement – are significant indicators of the main threats to the green infrastructure of agricultural landscapes. Beyond the maintenance of current landscape elements, the identification of positive predictors forms a starting point for the development of policies to strengthen/restore the green infrastructure and increase the presence of semi-natural habitat. The study highlights scale enlargement, average parcel size, and in-migration of agricultural ‘newcomers’ as farm traits significantly tied to patterns in the occurrence of semi-natural landscape elements and thereby offers focal points for further research and land management. Strong landscape planning can address contested interests that exist within the sphere of contemporary multifunctional agriculture and increase the compatibility of competitive commercial agriculture and the maintenance of rich semi-natural landscape elements. The feasibility of a stronger planning approach is however challenged by the rights and liberties of rural landowners, our limited understanding of the complex and nonlinear natural world, and the difficult task to weigh the multitude of stakes in agricultural landscapes. The case study offers new empirical arguments for policy development and planning decisions to improve the management of agriculture’s green infrastructure – adding a small piece of the puzzle indicative to a larger debate on land management strategies to reconcile the objectives of agricultural production with the need of biodiversity conservation in Europe’s spatially contested countryside. CBS (2012). Hobby Boeren 2011. Hobbyboeren 2011, Heerlen: Retrieved from http://www.compendiumvoordeleefomgeving.nl/indicatoren/nl2127-Hobbyboeren.html?i=11-61. Hauser, L. T. (2012). A bird’s eye view: A case study on the relationship between farm management and “green veins” in the multifunctional agricultural landscape. Master Thesis. Utrecht: Utrecht University. Knierim, A. and Siebert, R. (2004). Towards multi-functional agriculture–What motivates German farmers to realise biodiversity conservation. Proceedings of the 6th European IFSA Symposium. Vila Real, Portugal: 283–292. Opdam, P., Grashof-Bokdam, C. J. and Van Wingerden, W. K. R. E. (2000). Groene dooradering: Een ruimtelijk concept voor functiecombinaties in het agrarisch landschap. Landschap 17(1): 45–50. Sutcliffe, L. M. E. Batáry, P. Kormann, U. Báldi, A. Dicks, L. V. Herzon, I. Tscharntke, T. et al. (2014). Harnessing the biodiversity value of Central and Eastern European farmland. Diversity and Distributions, DOI: https://doi.org/10.1111/ddi.12288 n/a–n/a. Tweede Kamer der Staten-Generaal (2012). Wijziging van de Wet algemene bepalingen omgevingsrecht en enkele andere wetten om de planologische status van gronden en opstallen bepalend te laten zijn voor de mate van milieubescherming alsmede om de positie van agrarische bedrijfswoningen aan te pass. (2): 1–4. Retrieved from http://www.eerstekamer.nl/behandeling/20111107/voorstel_van_wet_4/f=/viuehe13w5vs.pdf. Walford, N. (2005). Agricultural restructuring during the closing decades of the twentieth century: Evidence of farm size in South East England. Geography, : 238–249.